I first heard of pen names when I was eight. The idea of using a different name intrigued and excited me since it all sounded so much fun to have a different identity. I could consider it as an alter ego or even an escape from my real life. When I started writing and reached a point of wanting an audience, I thought about pen names again. I told myself, “It would be cool to use a pen name. No one would know it was me. Imagine if my friends read my work, and talked about it without even realizing that I was the one who wrote it.” On that motivation alone, I grew excited about creating a pen name. I knew it was reckless to rush into making one, so I let it come to me naturally. A few years ago, I was writing a story. The heroine was named Sapphira Winter P. Wright. Sapphira was a girl that had a strong sense of justice. She would defend anyone she loved and would make every wrong she saw right. When I wrote her, there was an odd link between us. She wasn’t like my usual characters, where I had to place myself in their shoes first. I already knew exactly how she would speak and act. This made me write about her even more. The unusual connection between us grew tighter until I realized that this character was actually an accurate description of my voice as a writer. Her strong opinion in every topic, her sense of justice, and her thirst for making a change in this world was everything that represented me as a writer. When I let this realization sink in, it was clear that Sapphira Winter would be my pen name, my identity as a writer. Since then, I have posted my work under my pen name, just for fun, but when I wanted to submit my writing for actual publication, I learned that I couldn’t because my school didn’t allow part-time jobs. Even if this might not have been considered as one, I didn’t want to take any chances since I was about to graduate. So, I started using my pen name for everything. Little did I know that I was already committing a huge mistake: using pen names for official business. I only realized that I was using it wrongly when I applied to join the LTC Team. I submitted my application under my pen name and used it when emailing Laura Thomas. I thought it was okay to use my pen name. After a while, I noticed that the writers on jaBlog! were definitely using real names. I shrugged it off. However, during my internship with Laura, she asked me for my Facebook page name, and that’s when I realized I wasn’t supposed to use my pen name for this opportunity. I panicked and sent an email to Laura immediately, apologizing for using a pen name and told her that I will definitely not do it again. I thought my chances in joining the LTC team were already destroyed, but to my relief, she just asked me to make it right by writing this article for you all. As Sapphira Winter is willing to make any wrong a right, I was happy to do this. 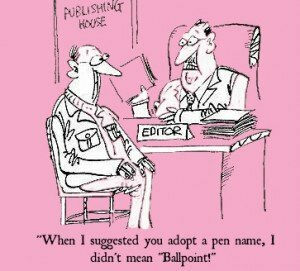 Since then, I have read about pen names on found out that I have been using my pen name incorrectly for many years. It was wrong to use my pen name for official business. And before I used one, I should have had it only for the right reasons. Just thinking it was cool wasn’t a good reason. To protect myself from getting into trouble at school was. I shouldn’t have come up with a pen name so thoughtlessly. I almost set myself on the wrong path as a writer. For everyone who is reading this, I hope you will avoid making the same mistake I did by researching about pen names first before using one. I find it commendable that you were brave enough to put this article up. It is written in a very absorbing way. I love the part where you discover that your character was actually you as a writer! As a young writer, I never considered using a pen name but I have several friends who do find the idea fascinating and wish to use pen names when trying to get published. I plan to show them this article so they can make a more careful decision. Well done!